Pitbulls are often very athletic. They will absolutely motivate you to get daily exercise, whether you’re just looking for a stroll around the block or a training buddy for a marathon. They also tend to excel at dog sports like agility. Pitbulls are hilarious. Just like people, all dogs are distinct individuals, but pitbulls are usually bursting with personality and they love to make us laugh by clowning around. Pitbulls love, love, love people. And they do not discriminate against humans for any reason. They crave attention and approval, and are very social with humans. They will do almost anything their favorite people ask just to hear praise. They remind us of this by wiggling happily and kissing us often! Pitbulls love to cuddle. Even the most athletic pitbull will also have a sedentary side and crave being cuddled and petted. Adopt a pitbull and you will have a constant companion keeping you warm in bed, on the couch, on your lap in your favorite chair. Did I mention that many pitbulls think they’re lap dogs? And the #1 reason why pitbulls rule? The ‘Pitbull smile’. They’re great for your mental health. If you are having a bad day, one look at your pitbull’s huge smile and lolling tongue will surely make you smile and their zest for life is infectious. Truly, happiness is a pitbull smile! According to the ASPCA, it is estimated that 1.2 million dogs are euthanized in shelters across the United States every year. (For comparison, 1.4 million are adopted). While it's impossible to know exactly how many of these dogs are pit bulls, the best guess is 800,000 to 1 million; that translates to 2,000 to 3,000 per day. This figure is completely unconscionable and a shame on our society. But the euthanasia of 1 million blocky-headed dogs per year isn't even the only crime. Thousands of jurisdictions around the world ban or otherwise restrict ownership of these dogs -- leading to dogs being taken away from their families for nothing more than their appearance, and families living in fear of losing their beloved pets. 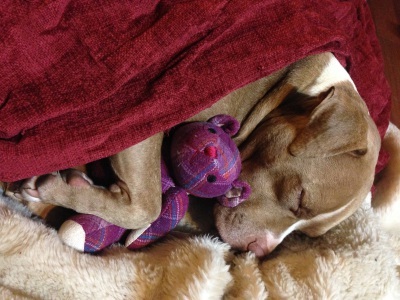 And even in cities that allow pit bulls, housing can be near-impossible to find. 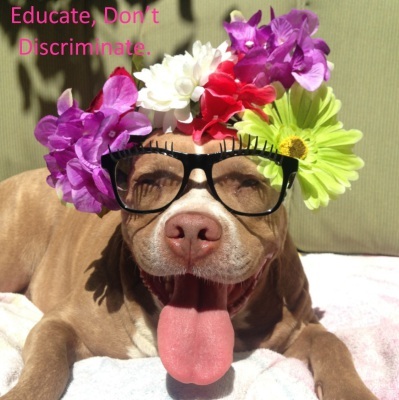 The myths surrounding pitbull type dogs are archaic, based on fear created by sensationalized stories reported in the media. It's time we stopped the discrimination and really tried to separate facts from stories and truly understand these beautiful, loving dogs. The media typically portrays pitbull type dogs in the most unflattering, agressive and otherwise sensationalistic situations. This includes the photos they circulate as well as the languague they choose. This contributes to the overall image some sectors of the public believes to be true andfrom here theimage of pitbul as 'monster' is manufactured. When you search the internet for just a mintue or two you will find mulitple images and beautiful stories about these dogs that will melt your heart. These stories and photos display our favourite dogs in thier true nature. Loving - Silly - Caring - Gentle - Sweet - and... family.